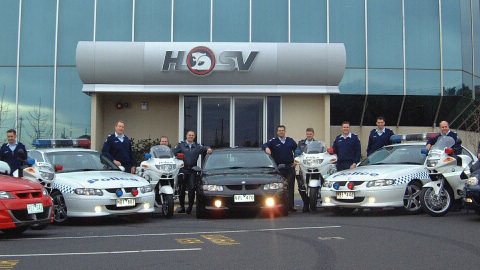 Members of the Victorian Police Traffic Management Unit made a surprise visit to HSV’s state of the art production and showroom facility in Clayton, earlier in the month. Whilst on tour, the Police paid particular interest to the ground breaking anti-theft technology - HSV DNA. HSV were the first Australian manufacturer to adopt the data dot technology. Each new HSV vehicle now carries an easily traceable genetic link to its HSV heritage. HSV DNA consists of about 10,000 data dots, each about one millimetre in diameter, sprayed randomly around the vehicle and also on the HSV build plate. HSV DNA will enable enforcement agencies to identify individual HSV’s and their components - rendering theft a pointless exercise. Tours of this kind help to further the commitment between both organisations to ensure that those who steal, get "court"!